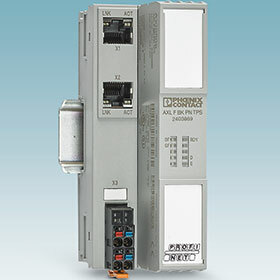 In Profinet applications, the Axioline F bus coupler is the link between the Axioline F system and the higher-level Ethernet system. As Phoenix Contact’s first Profinet bus coupler, the TPS version of the device offers certification in accordance with Profinet Spec 2.3. The bus coupler also features PROFIenergy support. This feature uses cutoff mechanisms to save energy when in an inactive state. In addition, the web-based management feature, which can be used for retrieving static information (such as technical data), MAC addresses, and dynamic information (such as IP addresses), has been expanded. For testing purposes, the Axioline F station can be started up independently of the higher-level network via the service interface or an Ethernet port on the bus coupler using the Startup+ software.